Salvation’s Fire: After The War is the second book in the ‘After the War’ universe; the first, by Adrian Tchaikovsky, having come out earlier this year. This book follows on from the events of the first, but it can be read as a standalone – though you may lose some useful context by doing so. This is the world after the end. After a dark threat has arisen, raised its armies and broken them against heroes. After the darkness has seeped in and poisoned the soil After the darkness has killed the Gods. After it has shaped a new world, one which necessitates co-operation and incentivises action. The great villain drew peoples together even as he broke them. In their shattering, they recombine into a stronger whole. And this book is part of that process. The war is over, that’s for sure. But remnants of the past are difficult to shift. There’s a sense here of spaces in recovery. Things are quieter, perhaps, than previous. Though there are still the poor, the destitute, the wandering remnants of armies, these things are less visible than before, though still a factor. This is also a world coming to terms with a lack of religion; in a space where the gods have been active and real, and where their servants and avatars have been embedded in the day to day, life without them is a complex, difficult, damaging work in progress. We wander forests – only some of which are on fire – and seas here. There’s the opportunity to catch up with several cultures, and delve into the harrowing depths of the broken citadel of the enemy. The description is tightly written, giving enough detail to set the reader’s imagination to filling in the blank spaces. It avoids baroque prose and gives out what it needs you to know, and invites you to fill in the remainder. This builds a living, breathing world from the struts of the narrative – though yours may look different to mine, they carry the same story. The world breathes, its denizens living, suffering, hopeful creatures, its locales a smorgasbord for the imagination. What I’m saying is, if you came here from the first book in the series, the world will feel familiar, but with enough differences to make you sit up and take notice. If this is your first step into this space, then I’ll say this: the depth and complexity of the world on display is impressive. This is more of an ensemble piece than the last book. Though there are some old favourites, there’s enough new people around to keep us guessing. Celestine, slayer of evils, whose search for redemption defines much of the series so far, is still here. She’s still tired, still questioning herself, and still unwilling to take any crap from any of the various gods, monsters and everyday idiots that cross her path. Celestine kicks arse, in between worrying about what she’s doing and why – which makes her feel rather human, in her competences and her doubts. There’s a focus here on Kula, one of the newer members of the group; a girl who has very little, and now has to decide exactly what she wants. Watching the other members of the team – demi-gods, old monsters and struggling heroes all – try to interact with a young girl is a delight, exposing as it does some of their own troubles, and the darker secrets beneath the personalities they put out for public consumption. Kula is thoughtful, strange and frightened, and those attitudes seep off the page as you turn the pages – and as her understanding of her purpose and that of the team grows, sodoes yours. At heart this is a character piece webbed into an ensemble adventure. Fortunately the characters are convincing, crafted with a precision which leaves them stepping off the page to pick up a snack and ask when youre getting to the next chapter. As an ensemble, they work well together, the conflicts and bickering keeping the wheels going, and a sense of deeper issues acting as a shadow over the lighter moments. Another new arrival carries a wonderful dichotomy about them – in things they have done, actions performed, regrets created. Yet they live and laugh and love with an energy and passion which belies that quieter emotional flow beneath. I won’t go into details for fear of spoilers, but rest assured – these are people, and their struggles and triumphs, losses and hopes will compel you to find out what they do next, and what choices they make. The plot – well, I won’t spoil it. But I’ll say this. It has moments which are truly epic, struggles which are also spectacle. It has moments of heart-rending sorrow, of people making appalling, difficult choices. It has some wonderfully dry wit in the dialogue, which made me chuckle, and some sting that made me bleed as I turned the page. It’s got individual stories, moments of personal growth and suffering which show us individuals shaping themselves, and it has explosions of magicn and power which (also) shape worlds. This is a clever, vivid, cunningly crafted work of fantasy, one which moves from the personal to the epic and back with swift, assured prose. It’s a good story, and one which will make you think in between seeing what happens next. Give it a try. 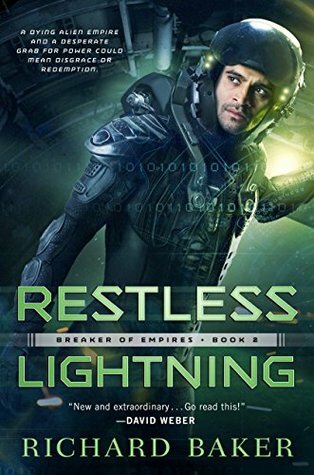 Restless Lightning is the sequel to last year’s ‘Valiant Dust’, a military sci-fi story which took the time to explore some socio-cultural issues in between blowing stuff up. The sequel takes us to whole new worlds, but keeps that attachment to broader themes which made Valiant Dust so interesting. It’s happy to talk to you about life and love in a space navy, but it also wants to talk about cultural homogeneity, stasis, and the struggle to retain identity in the face of a cultural conquest. The story also, to be fair, wants to blow some stuff up. Sikander North is still the protagonist – the scion of a rich and powerful family, but one whose world was recently appropriated into a cross-system federation relatively recently. Egalitarian as the Aquilan Federation claims to be, its members tend to come off as confident in their own superiority, and Sikander left to prove himself as not being a second-class citizen. This exploration of the idea that even the ‘good’ guys have their blind spots – so assured of their own truths that they don’t often question them – is welcome. It also lets us see Sikander, a son of privilege in the extreme, in a more positive light. As an outsider, he struggles against social and cultural expectations even from his own position, highlighting the woes of those below. From a character standpoint, Sikander makes for an interesting protagonist. Alongside his difficulties integrating with an imposed culture lives a man who wants to do the right thing. A hero in the classic mould. If his relationship with his superiors is a complex, often tumultuous thing, his sense of right and wrong is not, or his sense of duty. Doing What’s Right has defined Sikander up to now, and it’s nice to see that extended here, even if there are consequences to be had, or indeed, different definitions of what’s right. Which brings us to antagonists. I shan’t spoil it, but was immensely pleased to see time given to Sikander’s antagonist as a viewpoint. As an individual, they appear to be making difficult, painful choices, and even when some of them were awful, and others disagreeable, you could see the path taken to get there. In a different story, perhaps, the villain would become the hero. It’s a wonderfully nuanced portrayal of an individual acting within their own bounds to serve what they thing of as a necessary goal – as, after all, no-one is a villain in their own story. It’s here the text excels, giving us an antagonist wo is themselves thoughtful, idealistic and determined to do the right thing – by their own lights. The complexity is appreciated, and gives some added depth in between the compelling action sequences. This is a story which asks questions of its readers. When is social and cultural capital a weapon? How far can you stretch soft-power? What are the ramifications of economic warfare, and can you push people far enough that they’re willing to act in their own worst interests just to make it stop? These are big questions, woven seamlessly into the narrative tapestry. There’s some answers floating around in there too, though I think as a whole the text embraces the show, not tell, philosophy. That said, this isn’t entirely (or even mostly) a book of meetings about trade. There’s enough hull metal and big guns floating around to satisfy anybody. The space combat is there, and some of the ground action that kept the heart pumping in the previous novel. The blend of the stately dance of space warfare is tactically convincing and well realised; the infantry battles are visceral moments of violence entwined with adrenaline and blood. It keeps you turning pages, that’s a fact. The characters definitely have the depth and complexity of real people, and they’re working against a well-drawn background to provide a masterful blend of politics, personal drama and hard-hitting military action which kept me looking at the next page, and the next, and the next. So yeah, if you need some more sci-fi military action, this continues to be a breakout series that is absolutely worthy of your attention. So, War Cry. It’s a new novella from Brian McClellan, whose flintlock fantasy ‘Powder Mage’ series has taken the world by storm. 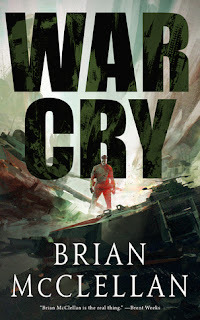 War Cry is an introduction to a new series, a new world. It has new characters, and new secrets to discover. Is it any good though? Well, yes, actually. It really is. 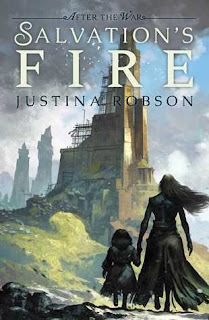 The short version is, this is a tautly plotted war story with enough steady characterisation to keep you reading, and enough cool bits that you’ll want to. The long version starts here. It starts in a world devastated by war, and tired of conflict. It’s a small world, granted. Just a few kilometres across. But that’s enough for a team of military scouts, lurking in a camp in barren, rough terrain, keeping an eye on an enemy they’ve never found a reason not to hate. This is a world which lives in a war that, for its inhabitants, has no end. They’ve grown up with war, they’ve lived with war, they’re fighting a war, and they fully expect to either die in combat or later, with the conflict rumbling on in the background. The mood evoked is one of exhaustion, seeping off the page in draughts of crappy coffee and all-nighters. There’s a sense in there, too, that this is a war old enough that no-one can remember why it happened, or how to stop it. Everyone seems tiredly resigned to the conflict grinding on, and their resignation seeps through the text. This is a place where everyone is performing their duties by rote, where blood and death are a matter of procedure, rather than ideology. The environment is interesting as well. There’s something in the biplanes, in the geography of quiet plains and mountains which recalls the Spanish civil war, and the sense of wide open spaces backed by plunging heights is one which will stick with me for a while. Into this space march the strange and unknowable; the Changers are monsters, killers, able to turn into something more and less than human. The Shining Tom’s, a last survivor of a different, less conflict-driven world, wield illusion like a knife, hiding aircraft, supplies, armies on the march. This is a world tired of war, to be sure, but it’s also rather good at it – and that professionalism wars with a sense of fatigue, to give us something which feels real – not the ra-ra patriotism of a TV advert, but the feeling of people dragging themselves out of an uncomfortable bed every day to do what they feel they must. It’s a job, a job backed by a long tarnished ideal, and by necessity. Into that job walks Teado. He’s a Changer. A monster. A killer. A man trying to figure out what the point of it all is, bemoaning the crappy coffee and debating whether its worth springting over the border and seeking asylum with the enemy. Teado has a sense of singular purpose about him, but that purpose is now riven with doubt, in the face of a long, grinding war where ideals have long ago given way to mud and blood. Still, he has a refreshing honesty behind the fatigue – loyal to his squad, to the friends they’ve now become. Acerbically cynical about the war and its causes, but fatalistically accepting of a rle within it. Teado carries the sense of a veteran about him, as do his team – and if he’s special for is powers, they think no less of him for that. Make no mistake, this is a war story, an introduction to a world steeped in a long running national grudge match. But it’s not a story where force of arms and glorious charges win the day, but one where individuals are doing their very best to survive, and perhaps incidentally, to win. Teados squad are a delightful pack of individuals – a superior broken by tragedy, a hardened colleague, a flyer obsessed with his machine, an illusionist trying to work out who they could be in another, quieter life. In their mundane concerns and their passionate responses, they help carry and convince Teado as human. The plot – well, it rattles along at a good pace. There’s excitement, adventure and high stakes derring-do. There’s battles, for sure. There’s blood and guts and the sort of emotional punch that leaves you wanting to have a quiet drink and a think about what it means to be people. There’s thoughtful subtext about the shapes of conflict and they way it resolves. And also there’s magical war-lizards, illusionists and bombing raids. 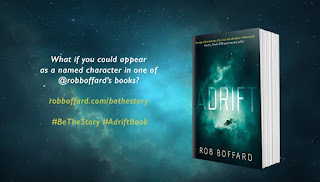 Rob Boffard - Becoming a character competition! So, Rob Boffard, whose books I have said very nice things about in the past, is having a competition. The prize is becoming a character in one of their books. They're really rather good books, and this is a chance for literary immortality. With that in mind, I encourage you to pop over to their site before the 15th of October and get your entry in. Reading about characters in Rob's work is always a joy, but reading about yourself has to be one notch up. Anyway, get in there, enter, (maybe) become immortal! What have you got to lose? 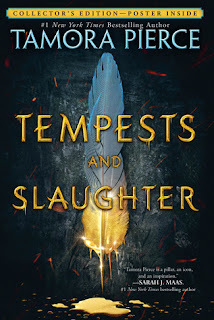 Tempests And Slaughter is the start of a new series from Tamora Pierce. If you’ve not read any of her other work before (and I hadn’t! ), it works as a standalone series. I’m told, though, that it also ties into the prequel history of some of her other, existing series – so if you’re an existing fan, it sounds like there’s a rich vein of history and lore for you to delve into here. On its own merits, though, this remains a book worth picking up and giving a read. The centre of the book is Arram Draper, a child growing into adulthood. Arram is a thoughtful boy with an absence of social graces. Left in the care of a magical school by his family, Arram begins the story alone and friendless. This isn’t really too problematic a state of affairs, as Arram doesn’t come off as a natural, charismatic leader. Though he has a well defined moral sense, he seems often happy enough in his own world, trying to discover how things work. That retiring nature, however, is backed up by extremely high magical potential, which makes keeping out of the spotlight more difficult than it might otherwise be. The portrayal of Arram is a sympathetic and detailed one, which lets us behind the eyes of a young person growing toward adulthood within an isolated, institutional framework. The text doesn’t flinch away from the consequences of his social awkwardness mixed with potential; in fact it wants to look at the resentment that this can generate, and the way Arram faces up to that. But at heart, it’s letting the reader into the head and heart of a boy who hasn’t yet worked out who he is, trying to shape himself against the vicissitudes of a system which takes a particularly strong interest in shaping him, possibly not for his own benefit. I’ve got a lot of time for Arram; that story of social confusion and awkward intelligence gives him a heartfelt humanity. This is a protagonist who may not (yet) be shaking cities or throwing lightning, but between being a magical prodigy, he’s afraid, looking for approval, looking to define himself as much as anyone at that age. A reasonable amount of the book is walking alongside Arram as he tries to figure out who he is and what he wants – through classes in history, through magical experimentation, through talking to tutors and making friends. In some ways, this is a comfortable tale about self-realisation, with bonus thunderbolts. Arram isn’t entirely on his own of course – he makes a couple of friends, the effusive Varice, a young woman whose charm is already dazzling, and the more taciturn, conflicted Ozorne, a prince so far down the line of succession that it seems like everyone’s forgotten he was there. Varice carries an effervescent energy and weight of emotional maturity which make a nice contrast to Arram’s bafflement – she’s just as likely as the other two to get into trouble, but more likely to have a backup plan or an eye on the consequences. Ozorne is by turns a social butterfly and morose, seeking solitude; there’s a sense there of a sword waiting to be drawn, a penchant for temper and some deep rooted anxieties and prejudices which, along with his own sense that he lacks worth, may make up an interesting emotional cocktail in later books. For now, though, this tripod of friends feels fiercely loyal, each accepting the honesty and capacity for emotional truth given up by the other two. If they are on occasion beset by bullies, or have to deal with teachers with a less than stellar health-and-safety record, still they bear each other up; even as the stakes grow higher, they do, still, bear each other up. It’s a complex relationship, a deep friendship with emotional undercurrents running through each member of the group – and if it’s possible to see potential cracks in the foundation, still it’s a heartwarming thing to see so tight-knit a crew of friends. In their day to day conflicts with each other, their discussions between themselves and with teachers, which shame them even as they looking at the world around them, in their affections and rare enmities, you can see a group of real, complicated young adults; their trials and tribulations mean they come off the page as people, even when they’re using magic for healing, or dealing with otherworldy entities – because they’re also crying over breakups, and losing their socks. This precision-crafted mixture of the fantastic and the prosaic makes for compelling reading. They live in a fully realised, fleshed out world as well, these complicated people. Indeed, their struggles with that world are part of what makes them tick. The land in which Arram finds himself feels like it’s the centre of the known world – with great armies, advances in medicine and arcane theory, and elaborate civic buildings. But behind the façade there’s something darker: one can see the blood and oppression of slavery, and a sense of superiority, even racism to members of certain geographical groups, born from an implied history of conflict and conquest. We (and Arram) see a lot of the glittering spires of the cognoscenti, but the underpinnings of the society are rather less pleasant. For all that, Arram’s new school, his new home, is a sprawling metropolis within an empire and his perspective lets us see that city at its best and worst, from the courts to the gutters. Pierce has crafted a rich and detailed world here, one with fearsome and imaginative depth, in which it was a pleasure to be immersed. The plot – well, I won’t spoil it. But it’s centred on Arram finding himself, learning to deal with his powers at the same time that he tries to deal with people. There’s some other stuff happening here too, though – the gentle swell of politics occurring just out of view, and a sense of stormclouds gathering over the horizon. 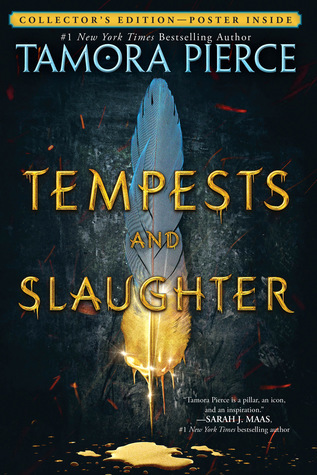 The title promised tempests and slaughter, and here they can be found, both metaphorically and...otherwise. But really, this is Arram’s story, a personal story about friendship and growth, and that was more than enough to keep me turning the pages. This is top notch fantasy, even if it’s not full of elves, dragons and epic battles. It’s about young people growing toward adulthood, in a world which is so different from ours, but also much the same. If it lacks in talking swords and buried treasure, it more than makes up for that with prose packed with honesty and heart. As a first time reader, this absolutely did not disappoint, and I’ll be coming back for more.